What is the Rare Disease Data Registry of Japan (RADDAR-J)? While each type of intractable disease only affects a limited number of individuals, the total number of patients with intractable diseases represents several percentages of the population. Investigating causes of the diseases and research into new diagnostic and therapeutic procedures are vital and highly demanded by society. The construction of a system for collecting clinical information and biological samples of patients and promotion of research and development through the storage of data from the analysis of such information and samples is crucial. In recent years, European countries and the United States have been promoting the construction of “patient registries” that integrate information on every rare and intractable disease, contributing to the identification of the causes of the diseases and the development of treatments. Sharing of registry information among medical professionals and researchers has promoted the diagnoses of previously unrecognized diseases and elucidation of the disease pathology, as well as the discovery of novel treatments. To promote research that makes maximum use of the patient registries, as well as building an integrated information infrastructure that enables cross-disease analyses, the following are essential: a system design that makes long-term operation of the registries possible, an operating system based on the relevant laws, regulations, and guidelines, and quality assurance of the accumulated data. In Japan, many research groups independently construct their own intractable disease registries, collect information on patients, and analyze the data using the registry. However, registry construction places a great burden on research groups, and it would be unrealistic to expect everyone to create a flawless system that meets all requirements. RADDAR-J aims at providing a support system through the construction of a National Registry covering a wide variety of intractable diseases, minimizing the burden on research groups and allowing them to focus on utilizing the data. We also aim to construct an information platform to enhance exhaustive research for each disease and to dramatically improve the elucidation of the overall picture and pathology of intractable diseases. Through the secondary use of the integrated disease information on the platform, we will promote further research of intractable disease. 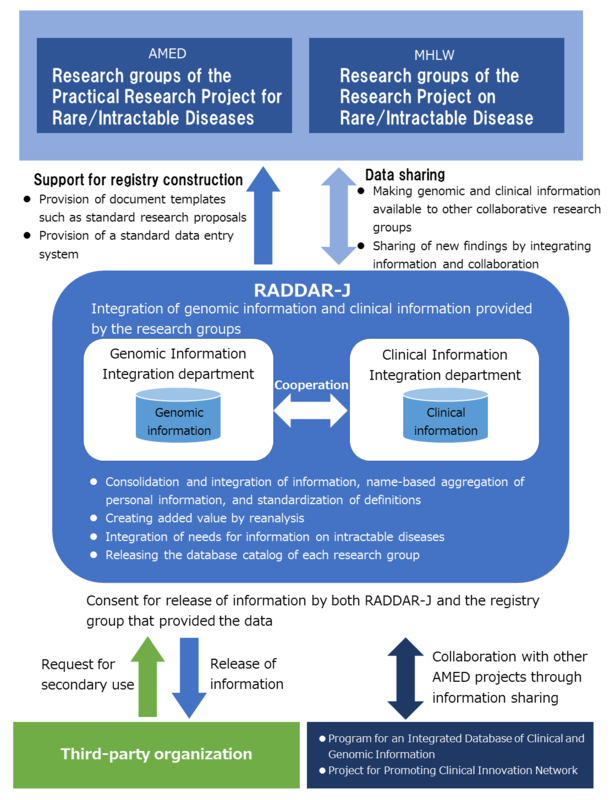 RADDAR-J is made up of the Genomic Information Integration department and the Clinical Information Integration department, a each with their own steering committee. The Genomic Information Integration department integrates and manages the genomic information, and the Clinical Information Integration department integrates and manages the clinical information provided by the various intractable disease research groups. The Genomic Information Integration department and the Clinical Information Integration department cooperate with each other and share the information. RADDAR-J is managed by following an operating manual, which complies with the ethical guidelines as well as the relevant laws and regulations.